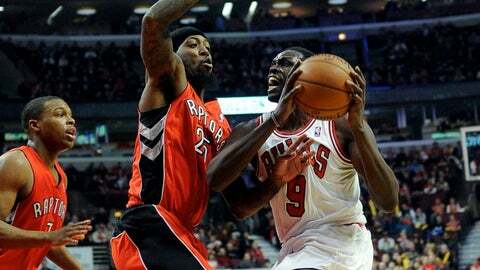 Chicago Bulls small forward Luol Deng (9) is defended by Toronto Raptors small forward John Salmons (25) during the first quarter at the United Center. CHICAGO (AP) — The Chicago Bulls will be without Luol Deng and Jimmy Butler while Kirk Hinrich will be a game-time decision against the Cleveland Cavaliers on Saturday. Deng, averaging 19.6 points, is missing his second straight game because of a sore left Achilles tendon. Butler left Thursday’s game at Oklahoma City because of a sprained right ankle. The Bulls were hoping to have Hinrich back against Cleveland after he missed four straight games because of an ailing back. Chicago had dropped four straight and 13 of 16 entering Saturday’s game.